You'll be instantly in love with this comfortable, detached house with distinctive architecture, with a split-level lounge at Calafell. Here is everything you seek. Lots of space, a lovely terrace with BBQ and a private swimming pool for a refreshing dip. Even though it is indicated that the house is for 8 people, there is enough room for up to 9/10 people. The garden is completely fenced and has a large lawn where the children will have plenty of fun. 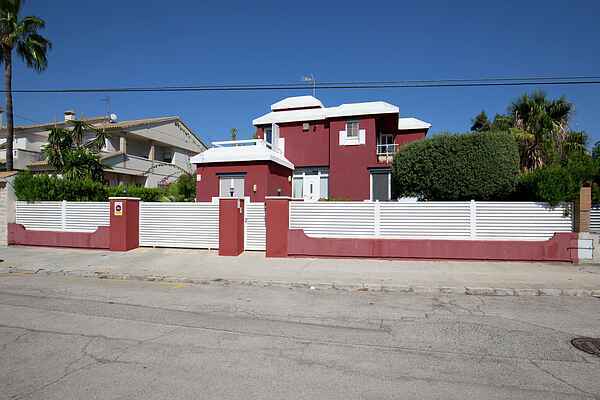 You won't need a car (anymore), La Casa Roja 'the red house' is situated on walking distance from the centre of Calafell (400 m). Calafell is one of the less touristy resorts on the Costa Dorada and is situated between the Mediterranean Sea and the Litoral mountain ranges. Visit the long and wide sandy beach (500 m) with a pleasant boulevard with local restaurants, a historic core and the Iberian citadel. Bowling and Carting is possible in El Vendrell (5km). Also visit the port city of Tarragona (37 km) and the theme park \"Port Aventura\" (47 km).